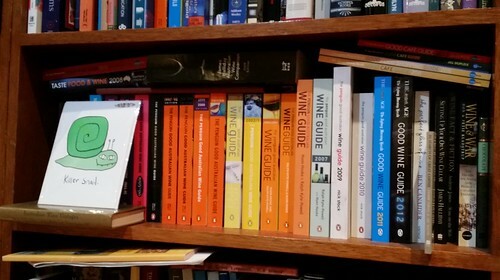 I’ve documented elsewhere my attempts to collect all the penguin wine guides. Alas I am yet to come across the missing volumes though I continue to look every time I find myself in a secondhand bookshop. The shelf itself is rather packed and the most edition currently resides on another bookcase altogether. My main stack of 4 bookcases, which I’m currently blogging my way along, probably needs some rearranging. Some shelves are packed solid, others still have a fair bit of space. I have also been collecting the SMH coffee guides, and have all published so far. Which reminds me, the latest one was announced this week and my old regular place, got the award for best coffee in Sydney again…I think that’s 3 years running for Coffee Alchemy. In a previous job, I spent a couple of years working from home and had planned to get myself a decent coffee machine and grinder. However around that time, Coffee Alchemy opened up and they were but a short stroll away. Every cup I had was fantastic. It seemed pointless getting my own equipment with Alchemy so close. Admittedly, on really wet days, I would stay indoors and make do with the plunger and stale coffee. These days I work in the city and only pop in every few weeks. They are still amazing.